News from the Hill: Challenges and opportunities for 2012 and beyond! Read on for the latest report from the Hill and how the Board is proposing Sims Hill collectively responds to the current climactic challenges at our next open members’ meeting on 25 September. We need everyone there to help us make Sims Hill one of the most creative and resilient CSAs in the UK. As you know it has been very wet now since April (bar two short sunny interludes). Indeed, it was the wettest June on record (159 years) and one of the wettest springs on record. It is not just rain, from April through mid-July there was precious little sun and warmth. To add to this it has been perfect conditions for slugs; they are at pretty unknown population levels and voraciousness. He goes on to say that the winter ahead looks bleak for local sales with a looming shortage of staple field crops. Things in the field on the Hill are no better. We have lost two sowings of carrots (and half of the third) to slugs. The onions and potatoes struggled to get going because of the wet and then they have been decimated by slugs. Early leafbeet and beetroot really struggled, as has the runner beans, lettuce and broccoli in the garden area (the courgettes were eaten in a week!). The sweetcorn germinated great but is struggling for lack of sun and warmth. We turned the squash in when it became clear they were not going to produce. We recently and belatedly got the chance to plant the winter brassicas (cabbage family) and leeks, let us hope they fare better! Most of the share at the moment is coming from the glasshouse that Sims Hill is growing in at Feed Bristol (on the other side of the motorway). In contrast to what has been happening in the field, the story in the large multi-span glasshouse couldn’t be more different. It is a pleasure and delight working in there, with nearly every kind of plant looking vibrant and lush. The cucumbers, tomatoes, and beetroot are looking particularly good at the moment. 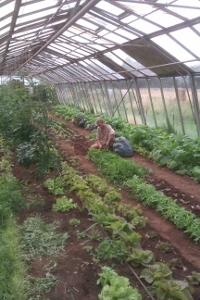 We are using the glasshouse as intensively as possible, with the time between one crop coming out and the next going in often just being a couple of hours. Regardless of the abundance in the glasshouse though, we are going to have a serious shortage of staple field crops this winter, which has serious implications for everyone involved with Sims Hill. It is clear that we will not have enough potatoes, onions and carrots to deliver what we reasonably hoped to as a share, and the shortfall will be too much to make up the difference with buying vegetables in. So we have some challenges to face. Ironically, the weather we have experienced highlights the need to develop more resilient local food systems and underlines the importance of the vision and role of Sims Hill for Bristol and beyond. What does this mean for Sims Hill? We had planned to establish the vegetable growing side of Sims Hill first, and then to develop the more ecological and educational aspects step by step over time. It seems that climatic conditions necessitate that we step up the pace of applying permaculture principles at Sims Hill. In short, this means shifting from an organic market garden approach with yield as the driving force within an organic framework; to capturing and using the sun and rain most effectively and letting the site influence what and how we grow. It will also mean pursuing the diverse range of activities we envisioned on the hill more quickly than we had originally anticipated. establishing an apprenticeship scheme and other learning opportunities. What options members choose to take is going to be critical, as is our ability to secure some wider support. The Board is aiming to present the options and strategies open to us as a co-operative and as households by email before the next open members’ meeting in September 25. The decisions made at this meeting are crucial to our future, and it is therefore important to have as much member input as is possible. Sims Hill is not just a veg box scheme, it is a community-supported agriculture project that is owned and run by its members. As members we all signed up to share in the risks as well as the harvest, thus helping to ensure the long-term economic security of the project. We will need everyone’s input and participation to see us through this time of great challenges and equally great opportunities.